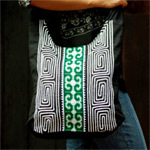 Working with cotton, the bags artisans of northern Thailand craft this shoulder bag by hand. They decorate the front with a large vertical band handmade by Thailand's Yao ethnic minority people and frame it with a labyrinthine pattern. Fully lined with cotton, the bag features two pockets in the inside. It closes with a zipper.